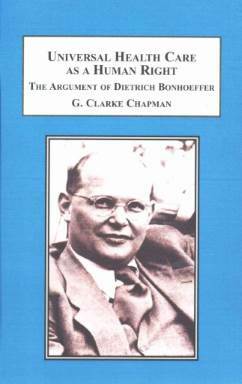 Bonhoeffer gave a theocentric basis for human rights, as God is the ground of ethics. In our earthly world, the “ultimate” must be prepared by what is “penultimate.” That includes humanity’s natural life and bodily wholeness, leading to human duties crafted by human reason. Nowadays, biblical texts should not be used as partisan weapons attacking government provision of health care, since all Scripture (even the Law) is seen as a Christ-centered focus on human redemption. Thus Bonhoeffer implies a right to universal health care, but leaves entirely open which practical structures may best provide it. Arguments about the Affordable Care Act of 2010 have become increasingly impassioned. But there's a deeper issue: why should basic health care indeed be accessible to every American? If society could agree on that principle, we might break the present impasse and discuss practical issues of how to provide care. Health care has always been a moral issue, intertwined with religious values. For centuries the Enlightenment's affirmation of human rights supported a public obligation to provide the basics for human thriving. But now libertarian interpretations of rights and freedom undermine traditional community obligations. We need new foundations of public morality. Creative insights may be found in Dietrich Bonhoeffer, a martyred hero widely respected in religious / ecumenical circles, and the secular public. His writings offer revitalized concepts of human freedom, natural rights, and divine will which provide fresh understandings of why a society should provide health care for everyone.